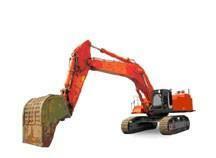 An excavator consists of a cab, an engine, dual bulldozer‐like tracks or treads, a boom arm, and an attachment. • The cab, where the operator sits, can pivot 360° on top of the tracks. Cabs also function as enclosed roll over protective structures (EROPS). • The diesel engine provides propulsion power for the tracks and powers the hydraulic systems that run the arm and attachments. New machines must meet the EPA's Tier III emissions standards, but older machines are exempt from those requirements. • The undercarriage includes steel tracks to move the machine around, along with the sprockets and rollers that guide and propel the tracks. • The boom extends from the body of the vehicle and connects at an elbow to the stick that holds the shovel or other attachment. • The attachment does the actual work. Most excavators come with a standard bucket – a toothed scoop for digging into dirt or gravel – but can support many other types of attachments. Other common attachments include augers for boring holes and thumbs for pinching or gripping, as well as hydraulic hammers, rakes, rippers, and mulchers. Most excavators are used for one or two dedicated tasks, but the flexibility is there for more niche applications. Some excavators use “quick attach” couplers that make it much easier to switch between attachments. If you intend to swap attachments frequently, a quick attach coupler can save a lot of time at the job site. • Monitoring systems. Computerized monitoring and control systems can help you get the most out of your excavator. They can be programmed to provide the optimal hydraulic flow for different attachments or types of work, which improves performance and reduces fuel costs. Diagnostic systems track fuel usage, operating costs, and maintenance needs, helping to find and fix problems before they cause real damage. • Power boost modes. Each manufacturer's power boost system works differently, but essentially these modes allow you to balance the power available to the boom, bucket, and tracks to best match the type of work you're doing. Some detect the type of work being done and automatically transfer power; others require manual selection of a work mode. • Backfill blade. Smaller excavators may come standard with a backfill or bulldozer blade that attaches below the boom. This makes it easy to refill and level after you’re done digging, without having to change attachments. • Climate­controlled cabs. Cabs with heat and air‐conditioning go a long way toward keeping operators comfortable and productive. • Anti­vandalism features. If you'll be leaving your excavator at job sites overnight, look for one that allows you to lock the controls to prevent vandals from damaging the machine or your work.